As usual, we hit that thang before I could run get the camera. My grandmother, "Honeymama" as she was known by us grandkids, used to make her Christmas fruitcake every year sometime in November. By the time I first sampled her fruitcake, a firm tradition had been established. Every year the first piece of fruitcake went to my Aunt Sandra, her second child. None of us could touch the fruitcake till Sandra had eaten the first piece. Aunt Sandra lived a good hour or two drive from Keene up on the prairie west of Springtown, Texas, north of Weatherford so she only came down once a month or so to check on her Mama. One year, not long after my Grandfather passed away, Aunt Sandra got busy with business affairs and didn't come and visit her mama as often as Honeymom thought she ought to. I was sitting in her kitchen a few days before Thanksgiving, looking covetously at that fruitcake when all of a sudden my grandmother stood up, pulled a big knife out of the drawer and approached the fruitcake muttering darkly. "If she can't be bothered to come visit her mother, I know someone who will appreciate a piece of fruitcake." 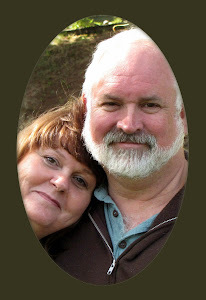 I couldn't believe it when she plunked a thick slice of fruitcake and a tall bottle of Dr. Pepper down in front of me. With a twinkle in her eye, she winked at me and went back to her early Thanksgiving preparations. 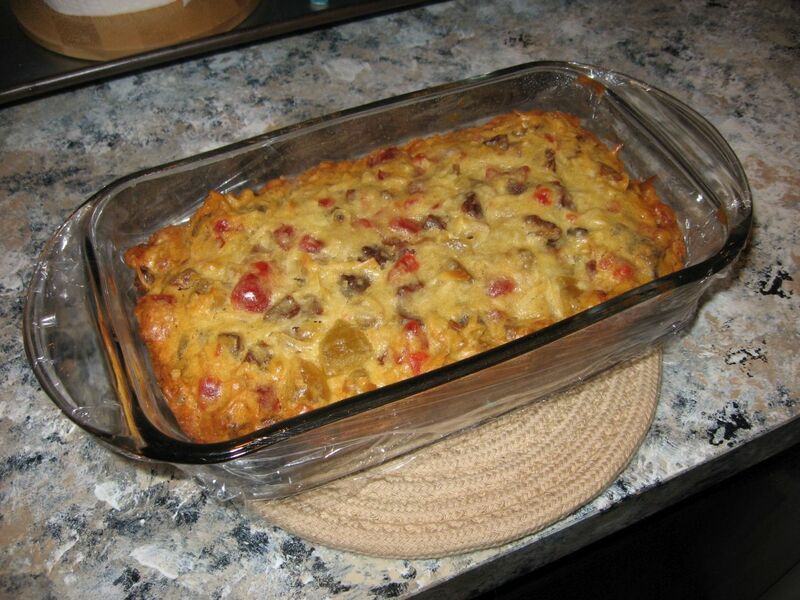 Honeymom gave a copy of her fruitcake recipe to Sheila years ago. I still have the handwritten copy. Apparently Honeymom got the recipe from "Aunt Dora", whoever that was. I should check the family tree to see who she was I suppose. Anyway, Sheila tweaks it a bit and no two fruitcakes come out exactly the same but they are all addictively delicious. She made two this year, the first with chopped dates which lasted about two weeks. The second time we didn't have dates so we made it with craisins (dried cranberries). Feel free to have fun with the ingredients. It's a very forgiving recipe. I think the secret is that neither Aunt Dora, Honeymama, nor Sheila use citron in the recipe. It's a nice mild fruity and dense moist cake. I can't resist it. Mix eggs, sugar, butter, and baking powder till smooth. Add spices till the batter tastes like you like it. Bake at 300 degrees for approximately 1 hour until a knife inserted into the cake comes out clean. This recipe tends to run over the top of our bundt pan, so we put some of the batter in a loaf pan and made a "giftable sized fruitcake" (right) and avoided having to clean fruitcake batter off the oven racks. One hint given to us by seasoned fruitcake bakers: Fruitcake tastes best if you let it sit for a few days in a cool corner before you eat it. Wrap it in plastic and hide it from yourself. It's the only way it's going to make it more than 12 hours without you losing control and chopping off a hunk of it. My Honeymama used to let hers sit for up to two weeks or until Sandra showed up for her first-of-the-season fruitcake. Serve with milk or either Coke or Dr. Pepper in the traditional bottle. If you can bear to give away the smaller fruitcake, cut it in slices after it cools, then put the slices in one of those plastic gift boxes or cake tins. Walmart sells them in the Christmas wrap section. Just slap a bow and a tag on it and you have a fantastic gift most people with working tastebuds will love. 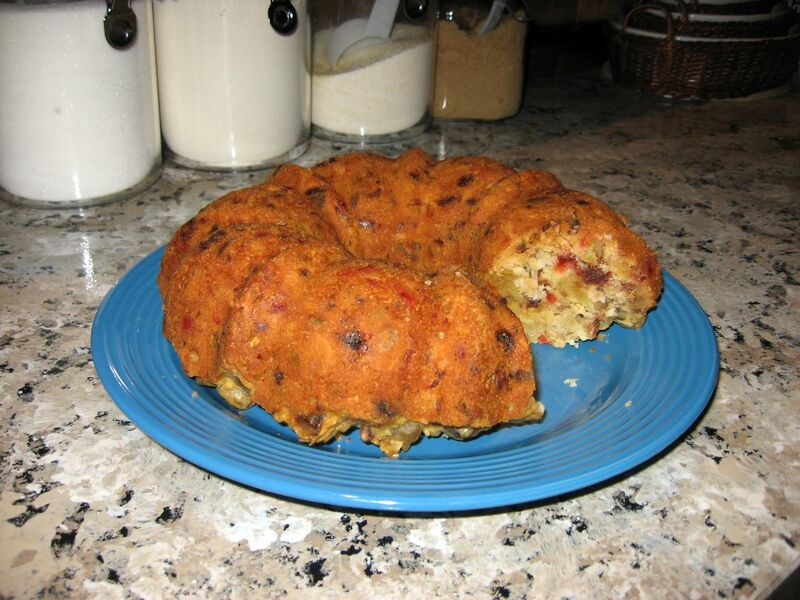 If you think you don't like fruitcake, you might want to try this fruitcake. The lack of citron really makes this a lovely collage of gentle, tasteable flavors and a tribute to the culinary genius of Aunt Dora, my Honeymama and my Sweet Baboo! If you find you don't like this fruitcake, box it up and mail it to "Uncle Tom's Home for Homeless Fruitcakes". We'll make sure your unwanted fruitcake will achieve its ultimate purpose in the grand cosmic scheme of things. Hi Tom. Merry Christmas to you and Sheila. Your fruitcake looks delicious. I'm also a fruitcake lover and threw a few dried cranberries in my dark cake this year. It was the best I've made in years. I have one question about the color of the cake. 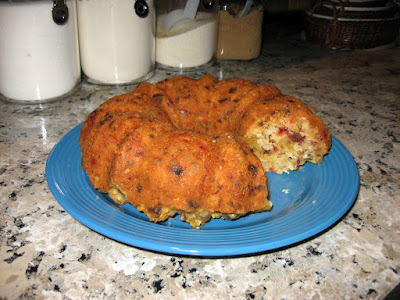 It is a light fruitcake from the pictures so I was wondering how much spices do you use? I find cinnamon and cloves darken a batter but your cake looks very light. The spice amounts are selected by the baker. I don't like a heavily spiced fruitcake. My wife is a genius at balancing the spices in fruitcake. I generally leave it to her tender mercies. She's the chef. I'm just the souz-chef. The Potluck Vegetarian is all about traditional Adventist lacto-ovo vegetarian cooking, the kind we grew up on at church potlucks. If you are looking for recipes you can use to demonstrate your vege-superiority over your fellow potluckers because of all the stuff that's NOT in the dish you brought to potluck, you're in the wrong place. We're going to look at recipes that taste good and no animal has to die to make it so. Some of our recipes will be vegan. Some may even be gluten or soy free. This will only happen if the recipe is delicious in its own right. That doesn't mean we won't use healthy ingredients. My Sweet Baboo can make lentils taste good enough to put on a burger bun. We will list all the classic SDA recipes and their variations. We'll search the fellowship halls of the world for recipes that will tempt your fellow church members to over eat. Truth is, once a month we don't see anything wrong with over-loading your plate a bit with the best tasting vegetarian food in the world. Happy Sabbath lunches to you all.